Centrally located to enjoy Dubai's main attractions, the award-winning hotel Hilton Dubai Creek is an acclaimed and distinctive choice. Guests can soak up the unique and magical atmosphere of a historic working route via this perfectly poised hotel. Guestrooms and suites offer creek views and plenty of luxury comforts, there's Executive Club Lounge services and a wonderful mix of charming restaurants serving world cuisine. Relax alongside the outdoor pool with refreshments from The Edge, and look out over panoramic vistas of the Creek. The Hilton Dubai Creek provides a day’s complimentary access to the Hilton Dubai Jumeirah’s private beach. A shuttle service is also provided for transportation. Enjoying a convenient spot on the Dubai Creekside, the Hilton is close to a variety of shops, restaurants, cafes and bars. 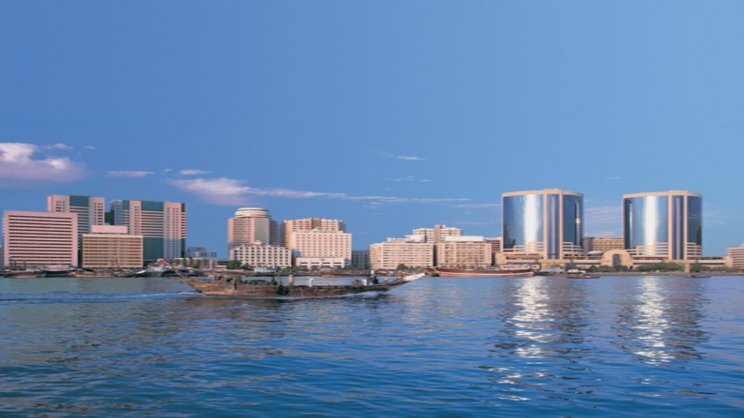 Dubai International Airport is approximately 5km away from the Hilton Dubai Creek. Floor-to-ceiling windows make it easy to soak up the sights of the city from these rooms. Filled with an array of Hilton privileges, it's ideal for up to 2 adults and 1 child. 37 square metres comprises floor-to-ceiling windows for great views over the city, seating area, marble bathroom and a host of standard privileges. Traditional dhows leave trails along the creek, sunset cruises and a flock of tourists, the action of the enchanting creek can be enjoyed from these rooms. Combining an array of Hilton amenities these room easily sleep 2 adults and 1 child amidst 45 square metres of space. Partial city and creek views are offered from these spacious and modern rooms. Neutral tones combine with superior furnishings and the host of amenities ensures a relaxing stay. 55 square metres is filled with Hilton amenities and plenty of style. Mesmerising views can be enjoyed from floor-to-ceiling windows. Look down over the city and Dubai Creek, it's captivating at any time of day. Relax in 69 square metres of living space and enjoy Executive benefits plus standard amenities including ergonomic chair and work area, marble bathroom and separate tub, combine with king-size serenity bed with feather comforters and pillows that are allergen-free. These suites boast a stylish and contemporary design. Contemporary and stylish, this refreshing venue serves a host of Mediterranean classics complemented by fine wines. The words trendy and chic spring to mind when thinking of Issimo, the place to be seen. Relax with friends and savour the exceptional bar food whilst catching up with the latest sporting event. An award-winning venue, this restaurant showcases the talents of a host of chefs serving their own bespoke and original menus. A personalised dining experience perfect for any event, Table 9 and it's stylish bistro atmosphere is a wonderfully unique experience. Soak up the sights and sounds of Dubai from this rooftop pool bar.